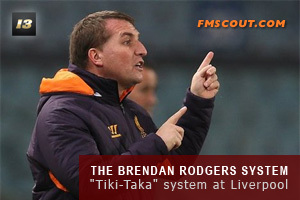 Brendan Rodgers' philosophy is one that is admired across the globe. His beliefs of how the game should be played has lead to some revolutionary football in the Premier League, first with Swansea, and currently with Liverpool. He believes in getting all the little things right. Keeping the ball is very important, and off-the-ball movement is clearly visible in this system. Defensively, he likes his team to put a lot of pressure on the opposing team. If you put your opponent under pressure, they have less time and space to work with, which may force them in to making mistakes. When his team has the ball, his players play a nice, flowing passing game with the ball always moving, making it impossible for the opposition to predict the next move. A master tactic in creation! As you can see, there are three different formations. You must be wondering, "why are there three different tactics? Surely they can't all be the same system!" Well the thing is, they can. I see formations as how your team sets up for matches. Your system,style is defined by your Team Instructions, which will be discussed next. 4-5-1: Brendan Rodgers' big-game set-up. He uses this formation when he plays bigger teams such as Man Utd, Man City, etc. This formation's main strength is it's three-man midfield system. It is a very good set-up for games where you just want to keep the ball and stay solid. 4-2-3-1: This is BR's set-up for playing similar/weaker teams. It's main strength is the midfield triangle again, but this time it provides more attacking movement for when you are looking to put pressure on your opponents. 4-2-4: This is BR's set-up for playing games where you just need to score goals. Having two strikers and two advanced wide players provides great attacking threat and is a nice tactic to use against table-strugglers. These are the team instructions, these are the settings which defines how your team plays it's football. This is where you create your style of football, where your master plan for success comes together. For each formation, these team instructions are the same. My belief is that you shouldn't play your style depending on who you play against, but how you set up (your formations). Philosophy: This is how your team acts through each phase of the game. With a very fluid style, your attackers will help defend and your defenders will help attack. This helps with passing options, causing problems in your opposition's defence, and you have more players defending when needed too. Strategy: This is how you take on your opponent. With Control, you will look to take control of the ball and move it around. This strategy is very good for a "passing team", which is what this entire system is looking to create. Passing Style + Tempo: This is how you pass the ball and how quickly you play your football. Short passing is good for keeping possession and creating "passing triangles" to get around your opposition. A high tempo means you move the ball around very quickly, making it impossible for the opposition to get anywhere near it. Creative Freedom: This is how free your players are to do their own thing. A more expressive creative freedom means that your creative, flair players will look to spark something special and do something extraordinary. Closing Down: This system uses high pressure to close down opponents. This gives the opposition players less time and space on the ball and forces them in to making mistakes. Marking + Tackling: Zonal marking is important to keep your defensive shape. This means your defense will always look strong and stable. Default tackling means your players will tackle as they are used to. This means they will still go to win the ball, but they won't do many reckless, leg breaking challenges. Defensive Line + Width: The defensive line and width are pretty normal to keep your defense in shape. Your defense will look solid and in line, with no gaps. The Wing Back is responsible for defending his team's flanks, while also contributing to the attacking play. In this role, your Wing Back will be a box-to-box player and is almost always available to offload the ball to if there are no viable passing options in midfield or up front. The central defenders are your defensive bricks. They are the most important players in your team and it is important that you get quality players for these positions. As Ball Playing Defenders, they join in on the passing and are very good with the ball at their feet. The DCR is a stopper and is the more aggressive tackler of the two. The central defenders are your defensive bricks. They are the most important players in your team and it is important that you get quality players for these positions. As Ball Playing Defenders, they join in on the passing and are very good with the ball at their feet. The DCL is in a cover role and is the better on the ball of the two. The Defensive Midfielder is responsible for breaking down your opposition's attacks in midfield. The DM needs to be a solid tackler, have good positioning and be a good passer for the passing moves. The DM is a deeper midfielder who will link up the passes. The AMR is an Advanced Playmaker. He is not a winger and will not act as one. He looks to create chances for himself and for others whatever way he can. He will look to cut inside when he can, but is not afraid of attacking the by line. He will link up with the midfield trio and will look to create space on the flanks. The AML is an Advanced Playmaker. He is not a winger and will not act as one. He looks to create chances for himself and for others whatever way he can. He will look to cut inside when he can, but is not afraid of attacking the by line. He will link up with the midfield trio and will look to create space on the flanks. The MCR is the Deep Lying Playmaker. He will sit deeper in midfield and orchestrate your attacks. He must have a great array of passing ability and be very creative. He must also be a decent tackler to break up attacks alongside the BWM. The MCL is the Ball Winning Midfielder. He is responsible for winning the ball in midfield when the opposition has it. He must possess good defending stats, and a high work rate. He must also be able to pass the ball well, to link up with the other midfielders. The AMR is an Inside Forward. His job is to cut inside and create chances for himself and others. He is a very attacking player and most be very good on the ball and possess a good shot. He will look to join up with the striker and carve open the defense. The AML is an Inside Forward. His job is to cut inside and create chances for himself and others. He is a very attacking player and most be very good on the ball and possess a good shot. He will look to join up with the striker and carve open the defense. These Touchline Instructions aren't necessary but I like using them to emphasis our style of play. As you can see, our results with this system have been fantastic. Our four best results of the season are highlighted. Needless to say, we won all four competitions we were entered in this year. There were some nervy moments but we went undefeated through the whole season, which is not easy. We played some fantastic football, as you can see in the screenshots below. 53 comments have been posted so far. And the FM14 version of this tactic has arrived! Guys, big announcement regarding the FM14 version of this tactic. Up until now, I have been tinkering with the new tactical system introduced by SI in the new game, and I finally believe that I have an in-depth knowledge of how tactics work in the new game now. I have created a base version of the "Brendan Rodgers System" for FM14, and I am currently in the midst of fine-tuning it in the shape which I would like it to take. It will be slightly different to this system, but I believe that the changes involved will be beneficiary and could really help the tactic. Over the next while, I will be finishing my fine-tuning of the new tactic and then once I believe that it is complete, I will upload it here and make it available for download. Thank you for your patience guys! i won 6 titles 3 fa cup 2 champions league with west brom and top hall of fame with newcastle. enough said. struggling in FM 2014, i hope u come out with a tactic soon. i tried replicating in fm 2014 but lost most. Tactic is very good for some teams, Chelsea for sure and AFC Wimbledon. But you have to be very patient! 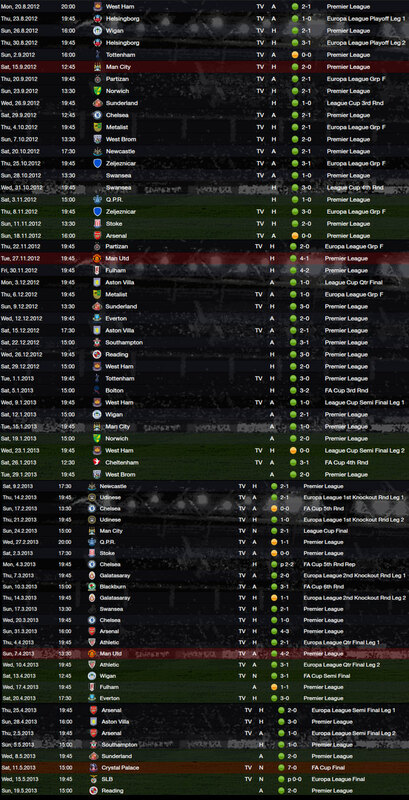 More than a half of first season you have to wait till tactic become familiary and then results will be great. The best of theese 3 is 4-5-1! Always, no matter who is your rival. To anyone who is having any difficulties with this tactic I would suggest you just give it time! When I first loaded it my team looked really uncomfortable at times misplacing EASY passes and looking lost, but now we're getting familiar with it they look like a whole different team, laser like passing, clinical finishing and solid defending. So, just be patient with it and you can soon reap the rewards, also follow the training guide, set Training to Tactics on Very High until familiar, then Ball Control on average after. For Match Training I used Defensive Positioning for a while because my team looked pretty good in the final third so wanted to concentrate in defending well. I also have stuck mainly with the 4-5-1 formation so I don't have to worry about that gap in between the Midfield and Defence. I have used the 4-2-3-1 in weak cup matches. @ArdlZ, just because this tactic doesn't work for you doesn't mean it doesn't work for others, mate. I've used this tactic with Vauxhall Motors, Ireland, South Africa, Spain, Manchester United, and several other teams, and it has still worked for me. Accuse me of cheating? Feel free, I don't care. I know I didn't cheat at all, and if you don't want to believe me, it doesn't bother me in the slightest. I think you should look at your own management ability before you criticise this tactic. It has worked for me and many others, so there must be a problem with your management skills. And just a word of advice. Don't make a comment just to flame a download or a topic, especially without any constructive criticism! If you can't help or be positive, don't comment! Either way, you're the only person who is going to look bad coming out of this. Nobody likes a hater. I like the way I play with this tactic. But one thing I don't like is the fact that the players are taking so many long-shoots! And I don't create that many CCC. Does anyone else experience the same thing? And if so, has anyone some ideas on tweeks? Well I'd say it is because it is not fluid yet. Otherwise, I honestly would stick to the 4-5-1 unless you are playing weaker teams at home. The 4-5-1 seems like the best of the 3 for handling this year's match engine. It's pretty much how I set up the team apart from playing Suarez in the striker-roll. Do you Think he's better as a winger? Before I saw your answet I acctully bought Will Hughes. I've played 7 matches (EL and PL) so far this season. I've stuck to the 4-2-3-1 because Ive played teams that I should be better then. Some games has been great! But others looks like crap. Could this be down to the fact that the tactic isn't fluid yet? Or should I play 4-5-1 away from home? I'd personally have Match Training set to maximum until the tactics are completely familiar. I liked to change it up a little depending on who I was playing, but I mostly stuck to the 4-5-1. GK: Reina; DR: Johnson, DCR: Kelly, DCL: Agger, DL: Enrique; DM: Lucas, MCR: Gerrard, MCL: Shelvey; AMR: Suarez, ST: Sturridge, AML: Borini/Coutinho. Great work! Beeing a Liverpoolsupporter I got to give this a go. When geting to know the tactic, how do I set up training? And should I stick to just one version in the beginging or shift depending on with team Im playing? How do you set up the team? Coutinho on the left wing? Sturridge on the right? Best line-up? Are there any players I should try to sell? Buy? WHat MAtch prep do you use? and for what training? I must say, i created an account here to encourage anyone to download this tactics. I wonder champions league with almost the same players as newcastle ( i am using newcastle without much signings). I didnt use any of the touchline shouts etc. The only negative is that the score are normally low like 1-0. But i am more than happy to grind out results! a big thank you to the creator. Anyway, i am a liverpool fan. 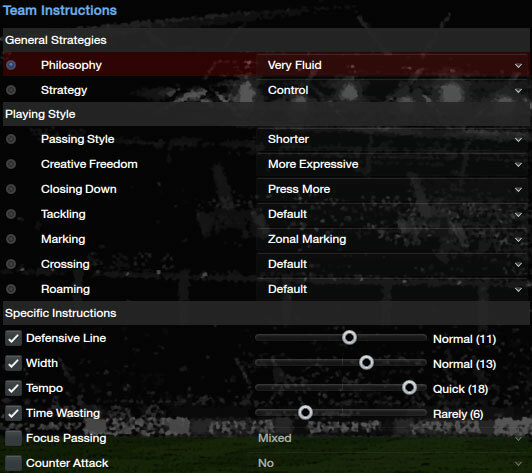 Good tactics.Works nice for me with Inter Milan. I just made a small change and use direct quick passing instead of short. Handcrafted in Symi, Hellas. Page created in 0.772 seconds.